Originally from Turin, Italy, the four Amoretti Brothers come from a long line of intellectuals and innovators. Together, they travelled around Mexico – and fell so deeply in love with the Mexican landscape that they decided to move there and open their own studio creating beautiful, handmade wares, in harmony with the local environment and working with skilled local artisans. The result? Amoretti Brothers cookware. Designed in Italy and made in Mexico, this is the most beautiful cookware you’ll ever see. Every piece is individually crafted by master coppersmiths from shiny copper, decorated with a hammered pattern that’s applied to the inside and outside of each piece by hand. Beautiful and practical, there’s nothing around that’s quite as breathtaking as Amoretti Brothers cookware. It’s cookware that cooks as good as it looks! Designed in Italy and made in Mexico at an environmentally-responsible factory by skilled local artisans. The body of each piece is individually crafted from 2mm thick copper with a double-layered virgin tin interior. Cast bronze and copper handles. Hand-hammered finish, inside and out. Suitable for all cooking surfaces, excluding induction. 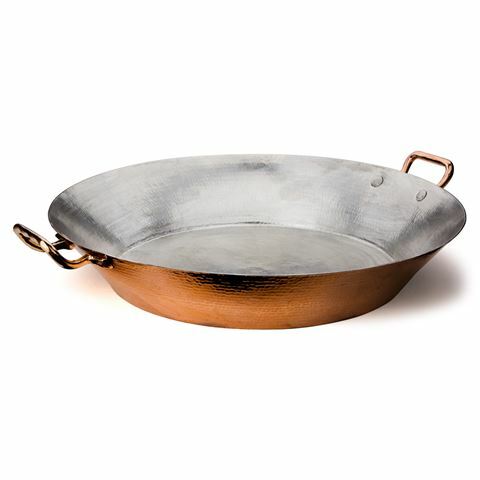 Apply copper polish to retain your cookware’s shiny appearance – however, keep in mind that your Amoretti Brothers cookware will change colour over time, which is a natural process and won’t affect the performance of your cookware. Beautifully presented in a wooden crate.